CASA CHIQUITA is the perfect home for a family or a larger group. 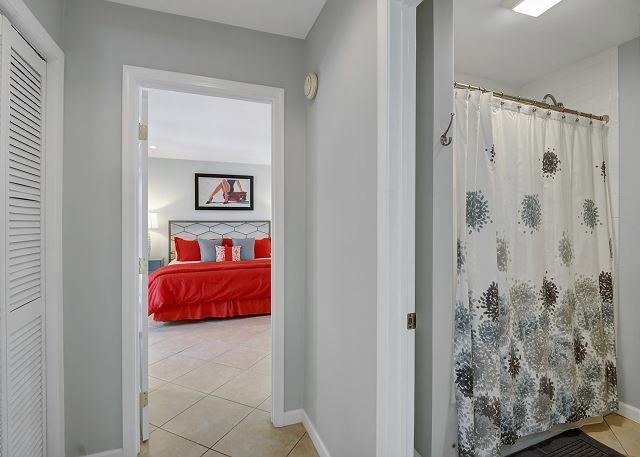 Having two separate master suites on opposite sides of the home, with two additional guest bedrooms and a shared full bathroom in between them make for the perfect set up. 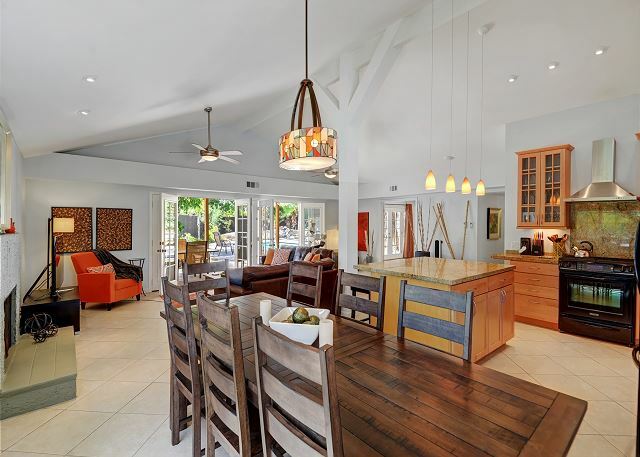 The large vaulted ceiling great room with an open floor plan allows the kitchen and island full exposure to the living room and dining room. Multiple French Doors lead out to the 16' x 32' salt water pool and Western mountain views. There are no neighbors on the back (North side) of the property and the cul de sac location allows for a unique lot shape with large expanses of yard to relax and enjoy the sun and mountain views. The covered back patio has outdoor dining for 8 and a gas BBQ grill. There are 8 chaises lining the 16' x 32' saltwater Southwestern exposure pool. 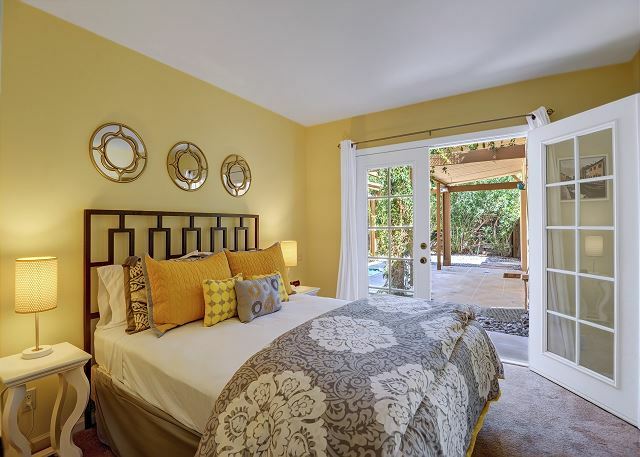 The spa is located off the second master bedroom under a quaint trellis for privacy and a comfortable nestled feeling. The living room has high vaulted ceilings, gas fireplace, 55" smart tv apps as well as TimeWarner Cable and a dvd player, 2 ceiling fans, leather sofas, and French doors that not only allow easy access to the pool – they also let in abundant natural light. The kitchen, with double sink and granite counters, is fully stocked with everything you could possibly need to cook and prepare meals. 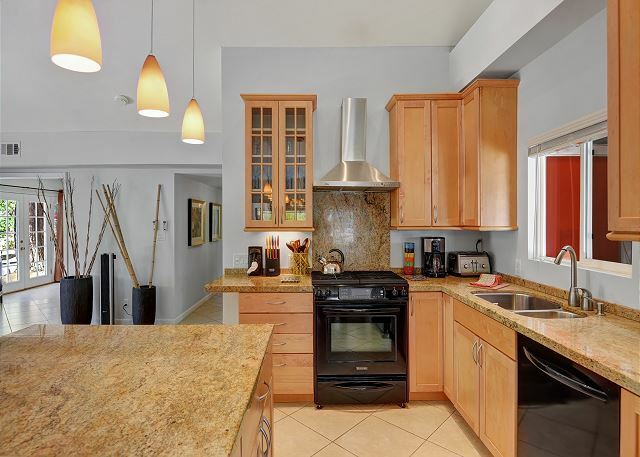 The kitchen is connected to the open floor plan great room and dining room – making it the perfect set up for your entire group to convene and enjoy your Palm Springs vacation. No one including the chef is left out! Master bedroom 1 off the living room with French doors out to the pool has a King sized bed, 32" flatscreen tv with TimeWarner Cable and a large en suite bathroom with double sinks, separate shower and Jacuzzi tub, and walk in closet. There is also a french door for pool access directly from this bathroom. Master bedroom 2 has a King sized bed, French doors out to the spa and side yard, and an en suite bathroom with a shower/tub combo. Guest bedroom 1 has a queen sized bed, large mirrored closet and French doors out to the spa and side yard. Guest bedroom 2 has a queen sized bed, large mirrored closet, and a window out to the side yard. The hall guest bathroom has a shower/tub combo. As others have already said, this house is amazing. We have stayed in many VRBO properties in the Palm Springs area, and this property was the nicest one yet. The beds were very comfortable, it's a great layout with lots of bedrooms, lots of dishes and supplies, the pool is beautiful and very well maintained, the backyard is private and lovely. Check in and out was easy. We would stay again! This house was everything we hoped for when we originally booked to stay for New Years' vacation. Great central location to down town PS, lovely bedrooms and terrific communal space and the pool and hot tub were perfect. The check in was incredible smooth and the company management friendly and available if needed. We would definitely stay again. This house was everything as advertised! Great location, easy check in, and wonderful amenities! I look forward to staying here again on my next trip to Palm Springs. We had a wonderful visit at Casa Chiquita for a Ladies Retreat with 5 of us. The home was beautifully furnished and the layout allowed for lots of togetherness as well as quiet moments. Wonderful, responsive hosts. Convenient, lovely neighborhood, incredible pool and spa, we hope to return! Our stay at the property was good. Exellent place with all amenities. Beautiful kitchen and bedrooms. Super clean. We stayed at Casa Chiquita for 6 nights and loved every minute of it. It was very clean, well maintained and in an excellent location for us. The pool was fantastic and we were in it every day. All four bedrooms were spotless and well appointed. The sitting room was cozy and enough seating for everyone and the kitchen was well equipped. The pictures available really do not do this villa justice. Overall we had a fabulous experience at the villa. It was easy to book and responses were quick to any questions. We loved our stay at this house. There are too many things we loved to list them all, so here are the highlights. Pool and entire outdoor area is phenomenal. It was an ultra-hot weekend and the shade from the trees was much needed. Next, the rooms were great, especially the first master that faced the pool (perfect to keep my wife connected to us in the pool while she breast fed the baby), and the 2nd master, where my elderly parents loved the privacy and access to the jacuzzi. Probably our favorite, though, is the great room, which made for some great memories when family came over. Decor is modern, yet without a compromise in comfort. We felt right at home! Highly recommend!! Oh, and the staff was amazing. Even helped my son get his ball off the roof. Casa Chiquita is a dream rental. All of the rooms are wonderfully done. The backyard is set up so that you feel you are at your own private resort. The kitchen is fully stocked with everything that you would need to make any type of meal. The location is perfect. If you like to walk there are shops about a mile or so away. There is easy access to all that Palm Springs has to offer. The staff was very responsive to every question and need. This rental is absalutly amazing!!!!! Great location (within 2 miles from down town strip) grocery stores etc. We had 8 adults with us for a weekend getaway and it was perfect. 4 bed/ 3 bath. And we were all very comfortable. The layout to this home is perfect. It felt everyone had their own space. The kitchen was fully stocked, with everything we could possibly need. And on top of everything, the house was so clean. The beds were very very comfortable topped with very comfortable sheets. The BBQ in the back yard was clean and looked new and well taken care of. And then there's the back yard and pool.. So increadably nice!!! Poole was huge!! Lounge chairs to accomadade all of us!!! Private corner lot!!! I will definitely stay here again!!! And to finish off. The property staff was amazing and very helpful. They answered any and all questions I had leading up to our stay. Thank you thank you!!!! We gathered at the lovely Casa Chiquita to celebrate a big birthday for my husband. Our goal was to find a location that was comfortable for four generations, including infants, a toddler and a great grandmother. Casa Chiquita was a great place to assemble. Each adult couple had a lovely room and GG could be comfortable in her own space. The big pool was terrific for the kids. They loved the floating net water chaises. They were perfect aquatic play pens (with parents by their sides). The kitchen was terrifically outfitted, with inside and outside tableware and great pots and pans. Loads of towels made our lives comfortable and the washer and dryer were easily accessible. We cooked in, brought in take out and even had a chef in one night to cook for us. The house was spotlessly clean. All went well. The only suggestion would be to address the slightly inconsistent hot water situation. We worked around it, but it could be improved. We would recommend Casa Chiquita whole heartedly. Casa Chiquita was lovely, on a quiet street but right near everything in town. Perfect for getting together with our family for a week. the pool was delightful, the hot tub great. the kitchen had everything we needed and the house was well set up for privacy. Would definitely come back. Our typical group has been traveling together for 10-years. I lived in PS for 12-years and hosted a getaway every 4 months for many years. Our group has grown large enough that we started renting houses about 7 years ago. This house was in a terrific location and had a wonderful layout. The kitchen was very well equipped, as if you could make Thanksgiving dinner. We made dinner and breakfast everyday. The home is very well outfitted with new thick towels, nice sheets, comfy beds and nice furniture. We had a parent drop by for dinner with 4year old twins and they so enjoyed the little puzzle to put together. Overall it was a great house in a great location. We WILL rent it again.